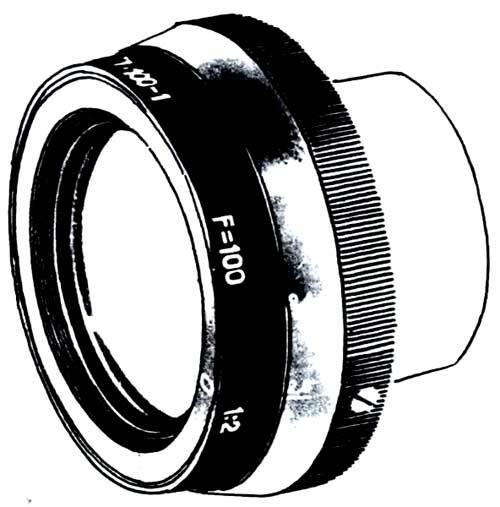 The OKS7-100-1 lens is purposed to get 'soft' picture in usual film shots. It has Petzval optical system. The Petzval lens was developed in 1840 by Joseph Petzval. It consisted of two doublet lenses with an aperture stop in between. The front lens is well corrected for spherical aberrations but introduces coma. The second doublet corrects for this and the position of the stop corrects most of the astigmatism. However, this results in additional field curvature and vignetting. The total field of view is therefore restricted to about 30 degrees. An f-number of f/3.7 was achievable, which was considerably faster than other lenses of the time. The speed of the lens is ideal for portrait photography since the exposure time could be reduced. Rare lens - I never had such model.